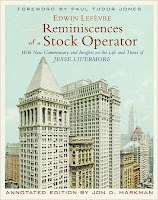 Using examples from his own trading experiences, Livermore discusses some stock market lessons he has learnt. The first lesson has to do with the herd mentality that is often possessed by large groups of investors. At times, that a certain security will rise or fall is considered so certain by investors, that they will go long or short in droves. Often, no one in the group will take pause to question their actions; instead, they will simply believe themselves to be right because everyone else is doing the same thing. Livermore has made much money trading opposite these herders. Another lesson Livermore has learned is that although he may be right about the future direction of a price, he may be wrong on whether he can convert his paper profit to an actual profit. This is because if one accumulates too many shares relative to the liquidity of the shares, the speculator may still have to take a loss even when he turns out correct on the price. Speculators should only take positions that they can get out of when they need to, or else they must be prepared to get out not on their own terms, but rather when an opportunity presents itself. Finally, Livermore recommends that the reader not listen to experts that claim to know something you don't. Livermore has lost a pretty penny thinking that he was trading on information that was superior to his own analysis. All he found was that he lost money when banking on the analysis of others. No matter how convincing analysts are, Livermore recommends that the reader do his own homework and draw his own conclusions from that homework.